Types: the structure of a score in terms of ML-types. 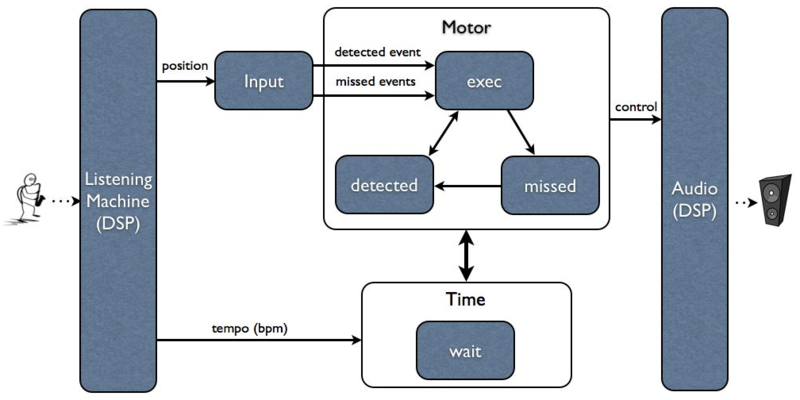 Time: processes to wait and compute duration relative to the tempo. Motor: the core of the interpreter i.e. the translation of the semantics rules. Groups: group treatment functions; slice, split and extract. Input: receive information from the listening machine or simulate it. Output: send messages to Max/MSP. AscoDemo.app: a standalone MacOS application that play the role of Max/MSP for the demos.